Indian Navy recently on 12th April 2019 launched its state-of-the-art 'Virtual Reality Centre (VRC)' at the Directorate of Naval Design (Surface Ship Group). 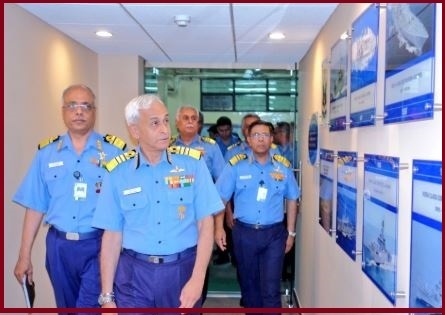 It was inaugurated by Admiral Sunil Lanba, the Chief of the Naval Staff. This Indian Navy's Virtual Reality Centre (VRC) is believed to provide a major boost to the indigenous warship design capabilities of the Indian Navy and will drive to self-reliance. The Virtual Reality Centre (VRC) project got designed & executed by the Directorate of Naval Design. It will facilitate joint design reviews for continuous interaction between the designers and the end users to improve the design and ergonomics onboard warships. The Virtual Reality Centre (VRC) will also boost the warship construction under the “Make in India” initiative of the Union Government. The Directorate of Naval Design (Surface Ship Group) was instituted in the 1960s and since then has made major contributions towards indigenous warship design capabilities of the Indian Navy, thus, improving self-reliance for warship design and construction. It has successfully developed 19 warship designs on which more than 90 platforms have been constructed till time.